Printed dresses can be spotted to the Egyptian era, worn by the ‘elite’ as a sign of their wealth and health. Whether it was the east or the west, the prints were always considered exotic and exquisite. For me, the prints piqued in the 70s when print wasn’t a means of showing off but a sign of liberation. A sign of individuality and the lack of need to bow down to the trickle down cycles of ‘straight’ & ‘boring’ fashion of the times. So much so, that one can’t think of prints without thinking of the retro decade. But! 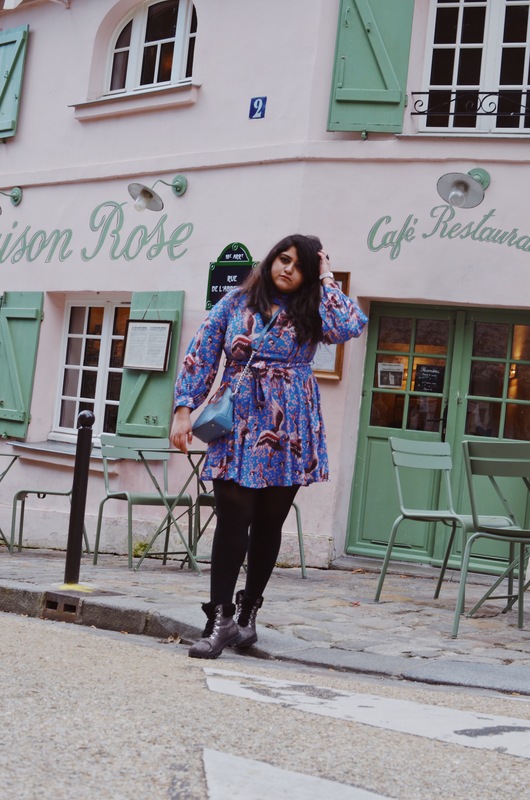 That’s common knowledge, so to add to it, I compiled a list of 6 rather unknown facts about printed dresses. I wanted to start by putting things a little bit in perspective though. 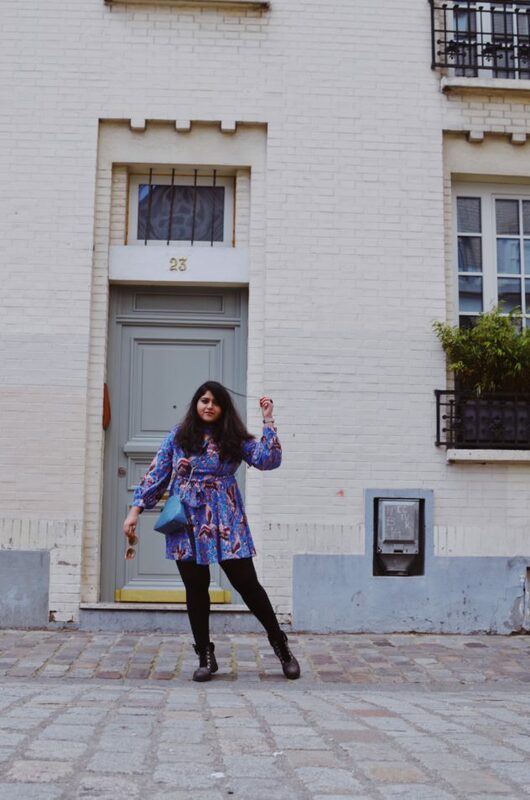 So, I put on a beautiful & exquisite Printed Dress with a Belt from my partner site Shein and strutted around in the old part of Paris – Montmartre. 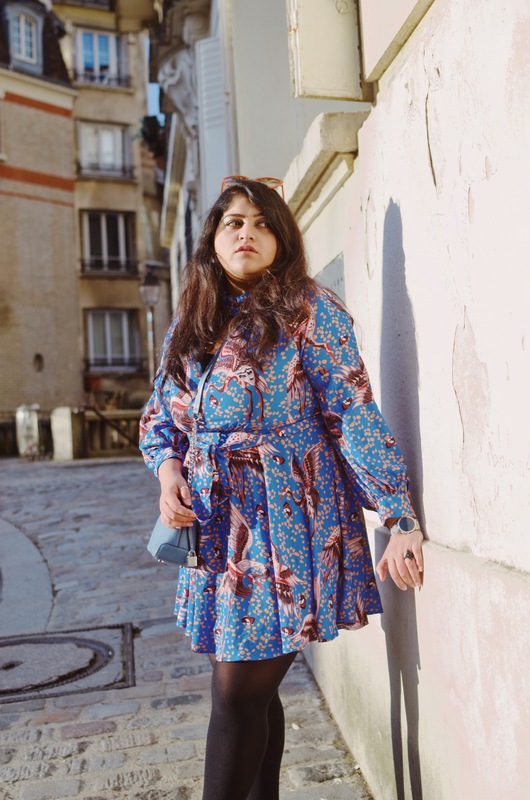 Go buy this dress by clicking here (shopping in India? click here). 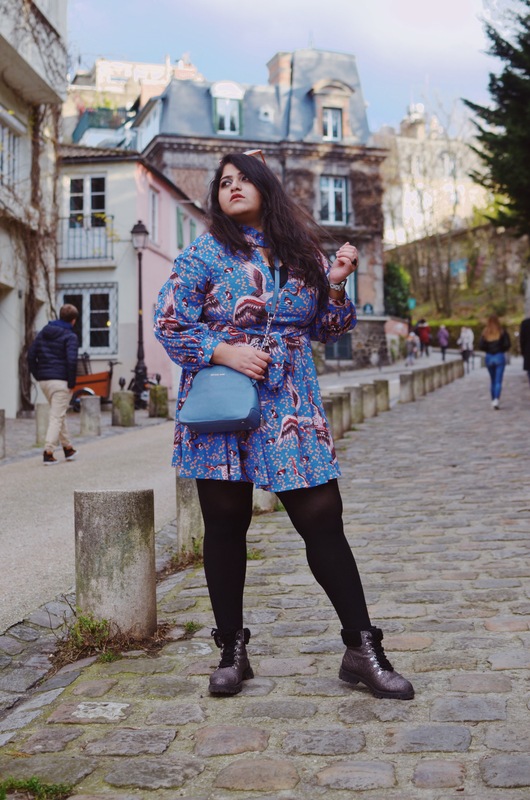 They have many other awesome styles, too and you can use code ‘9Aditi’ for an additional 15% off + worldwide shipping! 1. The first extravagant printed dresses or gowns at the time are found between the 1770s to 1800. These dresses are used printed cotton or chintz fabrics and were layered with heavier fabrics. 2. Printed Gowns made a comeback as the Printed Day Dresses in the mid-1940s. The reason could be that of the society recovering from the morbidities of the wars. These dresses were adorned by the ‘comfortable’. Still marking the exclusivity of the print which was owned and refined all through to the end of the 60s. 3. 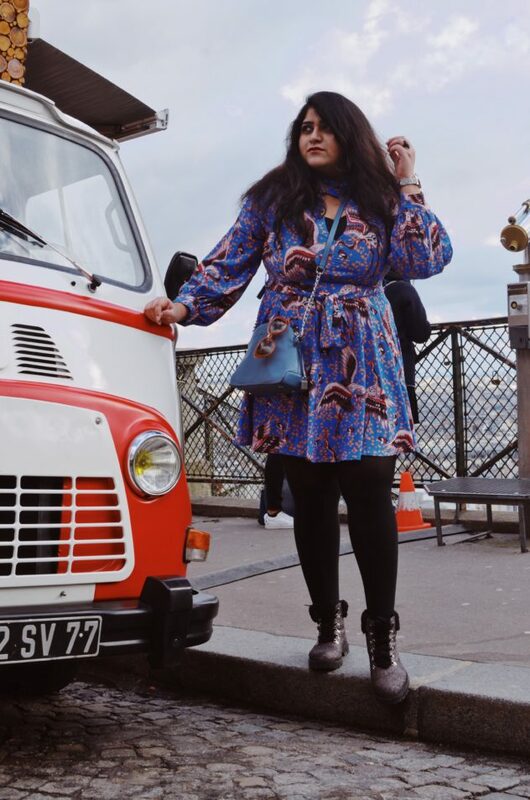 Celebrated as the ‘vintage dress’, the printed dress of the 60s is a celebrated symbol of the decade. What resulted in the widespread was the fabric called Crimplene that was known for its wash and use properties and was thus used to make the typical A-line dress of the 1960s. In fact, it was also popular amongst men in British mod culture for use in garish button-down shirts. 4. In the early 1970s, Crimplene was replaced by other, lighter-weight polyester fabrics like Trevira. This was because of their ease of movement and ventilation. Which basically resulted in the print being adopted by the rebellious and liberated of the 70s and resulted in a major shift of how the world perceives the print. 5. Of the several cyclic fashion trends since the 90s is the print. There’s still something very extravagant about the print dresses but now they are used to add a touch of retro. The last few years have seen the dramatization of the floral and animal prints, too. Big luxury fashion brands like Gucci went a little too extra in that department and made the comeback hot on the street scene, too! 6. With the developments in technology and the seamless imagination today, the possibilities are really endless. I mean, in no time you can even 3-D print out a whole dress for yourself at home (2018 News). Needless to add, the prints on the dresses will continue to thrive amidst it all. So, that’s the end of this list. I sure hope you feel a little more enlightened about the printed dresses and their cult now. If printed dresses are what makes you happy, or if you would like to add more to this list, go use the comments below as your mic. If you love this super amazing, high-quality outfit, don’t forget to get it from my partner site – Shein. Partnerships like these make the functioning of this blog possible. So, shoutouts to them! For more of my travel in style adventures, keep following ERTSY. Till then, stay curious, keep exploring!